Delray High School (c. 1925) became part of the Delray Elementary campus after the last graduating class in 1949. It served the community in this capacity until the mid 1980's when the entire campus was abandoned bu the Palm Beach County School District. 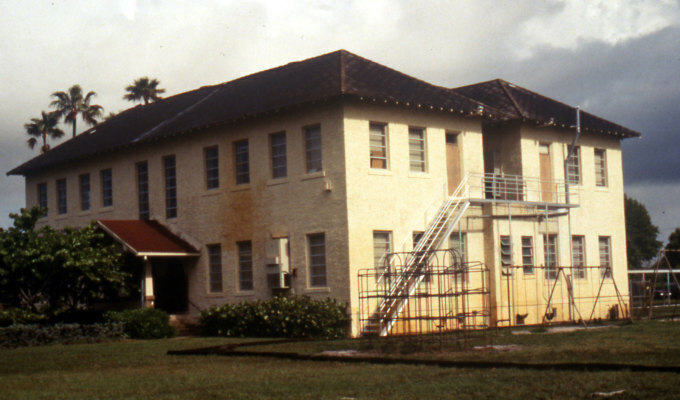 This photo shows the building in 1989, just before restoration. 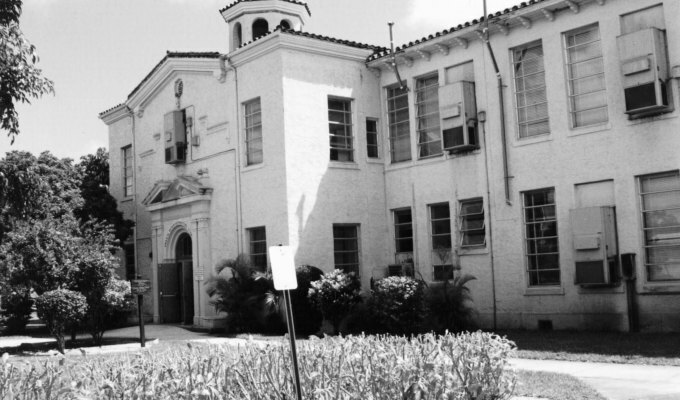 Old School Square was created thanks to the determination of a local group of citizens who saved the 1913 Delray Elementary and 1925 Delray High School buildings from demolition after they were abandoned by the Palm Beach County School District in the mid 1980’s. Over $7 million was raised to restore and re-adapt the facilities for use as a museum and theatre. 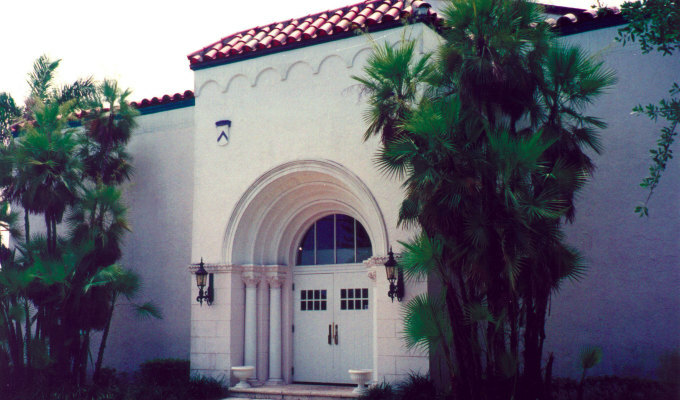 These Delray Beach Schools are listed on the National Register of Historic Places. The entire site serves as a gathering place for the community. 1913 – Delray Elementary was built on the corner of Swinton and Atlantic Avenues for grades one through twelve. 1925 – Delray High School was built just north of the elementary building, on the same site, to serve the growing population. 1949 – Last graduation for Delray High School. Plans were for a new high school to be built north of town, leaving the original elementary and high school buildings to serve as Delray Elementary. 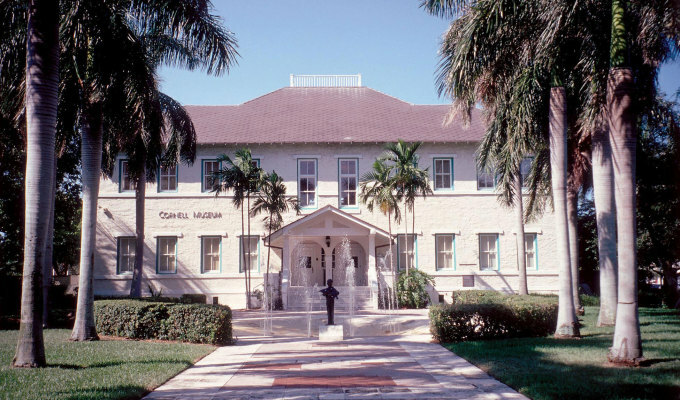 Mid 1980’s – Palm Beach County School Board abandoned both school buildings. A new elementary school (Banyan Creek) in the western part of town opened in the fall of 1988. 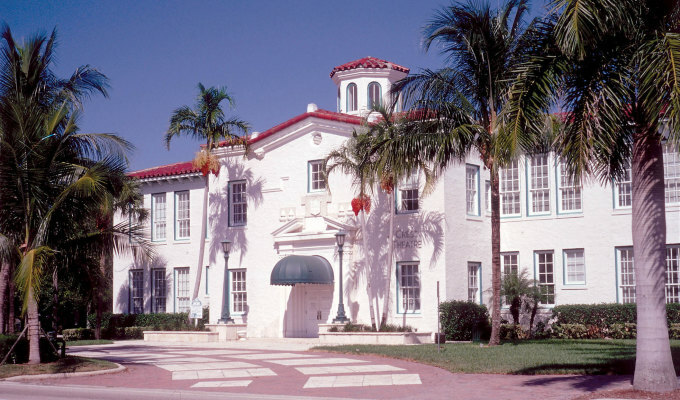 Late 1985 – A group of concerned citizens, spearheaded by then Delray Beach Historical Society Vice President, Frances Bourque, established a task force to save the buildings and recapture some of their historic meaning. In their view, this four-acre site, containing the two classroom buildings with a 320 seat auditorium and gymnasium, had great potential as both an important historic preservation project and an arts center benefiting Delray Beach and the surrounding communities. It was also thought that the restored buildings could jumpstart a plan to revitalize the struggling downtown, which had an occupancy rate of just over 30%. 1986 – The site was incorporated as Old School Square, Inc. and the ambitious restoration project was underway. June, 1988 – Delray Elementary finally closed. The buildings fell into disrepair and the site became a fenced, dilapidated eyesore. The task force, however, had been actively raising funds and working with the City of Delray Beach to acquire the property. 1990 – The 1913 elementary building had been completely restored as the Cornell Museum of Art and History; and the exterior restoration of the original high school building was also completed. 1993 – With restoration completed, the Crest Theatre opened its first season. 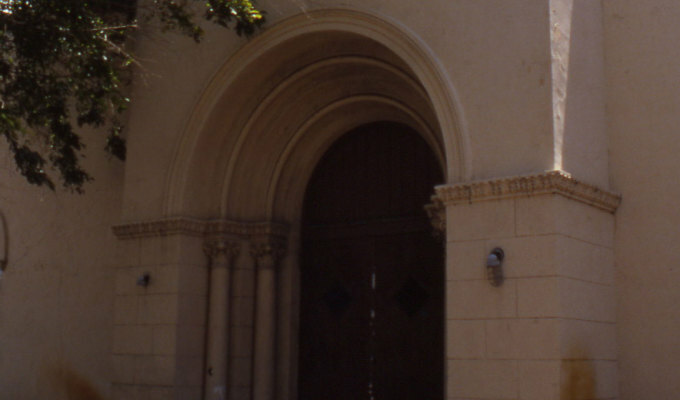 1998 – Restoration of the classrooms in the Crest Theatre building was completed. 2002– Phase I of a 10-year Master Plan for expansion was completed with opening of the Entertainment Pavilion.